It had been a long day. The tour left from Jerusalem promptly at 7am where we proceeded to visit and tour Qum’ran, Masada and the Dead Sea. By the time we arrived in Jericho it was 2pm and we were starving. I was honestly a little surprised that we were actually in Jericho. When I booked the day trip I honestly thought it was only a visit to Masada and the Dead Sea and that we would return to Jerusalem early in the afternoon. I was completely taken off guard when I was informed shortly into the van trip that we would be seeing about 1,000 sights in Israel and would be returned well into the evening. Actually, being completely misinformed made for a pleasant day as every stop was a new surprise. Sort of like a travel version of Christmas, er Hanukkah. After leaving the Dead Sea, we made the gentle crossing into the Palestinian Authority and quickly found ourselves in the city of Jericho -yes, THAT Jericho. Anyone with even a rudimentary knowledge of the Bible has heard the famous stories of this ancient city, so I was curious what we would find. I was also famished. It was well into the afternoon and while it may be common practice to eat later in Israel, my body had not yet made this adjustment. That was the real reason why I was so excited to explore Jericho. Thoughts of doner kabob (shawarma) and falafel filled the heads of my traveling companions and I. The historical sites had taken a definitive back seat to the promise of excellent street food. That is perhaps why I was so very confused when we pulled into the parking lot of what is arguably the best worst tourist trap in the world. I knew I was in trouble when I espied the sign on the main building – the Ahava Temptation Center. Ahava is a Dead Sea lotions manufacturer and it was clear the intent of the building was neither education nor repast, but rather unbridled and incredibly tacky consumerism. Mission one was food. It quickly became apparent that the only food within walking distance was at the Ahava Center. 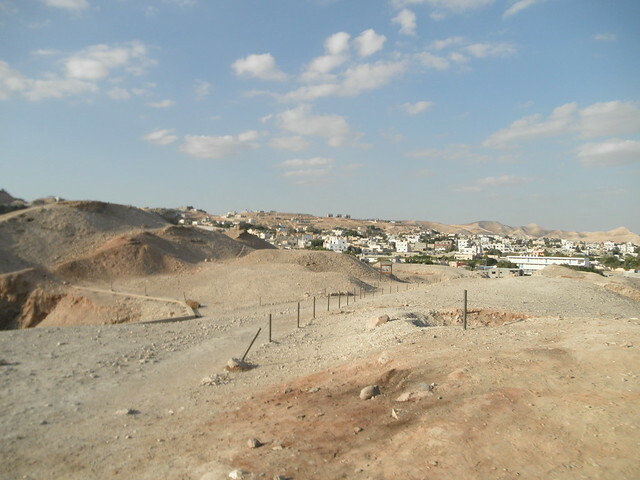 The real town of Jericho was no where near us and the only activities were to visit the ancient Jericho site and the Tourist Center. So we marched into the Center and were met with a little café that appeared to offer decent looking food. I started to go in when our tour guide grabbed my arm and led me away. He insisted that I didn’t want to eat there and led me upstairs instead to a restaurant of some sort. I never, ever trust a guide who tries to do something in my supposed best interest. Whatever they want me to do is never in my best interest and is usually something horrible. I still shudder whenever I pass a rug shop. That being said, I humored him and joined the group upstairs. Instead of a lavish display of shaved meats, kabobs, falafel and warm breads, I was met with an absolutely depressing cafeteria with a horrendously overpriced buffet. This would not do at all. I broke free of Mr. Pushy Guide and slunk downstairs to the café, appearing like an oasis in the Judean desert. As soon as I entered the threshold though a largish man approached and told me I couldn’t eat there. In a new travel twist for me, I was told that I needed reservations. I was so flabbergasted at the ridiculous notion of having to make reservations at a tourist trap located in the middle of nowhere at a tour stop I didn’t know I’d be making, that I just left. Food was not to be and I was suddenly wishing that I had eaten more at breakfast. Trying to regroup, I decided to salvage the stop by at least visiting the historic site of ancient Jericho across the street. I’m an archeology nut and anticipated a nice walk. I paid my 10 shekels, walked up the ramp and was met not with an exquisite archeological site, but rather by mounds of dirt. Seriously, that’s all it was, a series of dirt piles with no explanation and a partially rotted rope designating the trail. History fail. Hot, hungry and dejected I wandered back to the tourist trap to at least find a bag of chips or a candy bar. After poking around a cosmetics store and a pottery store (why does every country sell ridiculously overpriced pottery?) my snack mission too was a complete fail. I grabbed a Diet Coke and a five dollar package of roasted nuts and plopped down on a bench to wait for our time in Jericho to come to a merciful close. The visit had not gone well at all, and based on the looks of other travelers sitting hunched over on the park benches, I was not alone in my disappointment. The Palestinian Authority does not have a lot of control over many of the factors affecting tourism in the West Bank, I understand that. But they are participating in what WILL prove to be the region’s top money maker and they need to do more for the casual visitor. Rather than informative tourism, what instead is happening is some of the tackiest commercialism I have ever seen and an almost complete neglect of the sites tourists actually want to see. If the area is to have any success in attracting more tourists, this hideous trend must be reversed. But the roasted nuts were good, so they have that going for them, which is nice. Oh my God, that looks like a gravel pit on a construction site. Seriously? How disappointing. Triping is so full of ups and downs, right? Just gotta keep focusing on the ups! Bummer! This is why I loathe the big tour bus routes–I know it’s sometimes the only way to go, especially when traveling solo, but what a nightmare! While in Jericho, we located an ancient Herodian palace. Very cool–but we had our own cars and seriously risked them to get to the site. At least your other stops were more successful! Apparently “The oldest city of the world” is STILL under construction. It’s so terrible when that happens. On the positive side, that little fountain spot is really nice… I love the bougainvillaeas! I have to add visiting Israel, on a tour bus trip was one of the worst I have ever taken. The picnic for the day was kept in a bag not a cool box so by the time it was lunch, our white bread and cheese had melted not to mentioned had created about 1 million bacteria on the way. But you live and learn don’t you and it provides a story to tell if nothing else…. 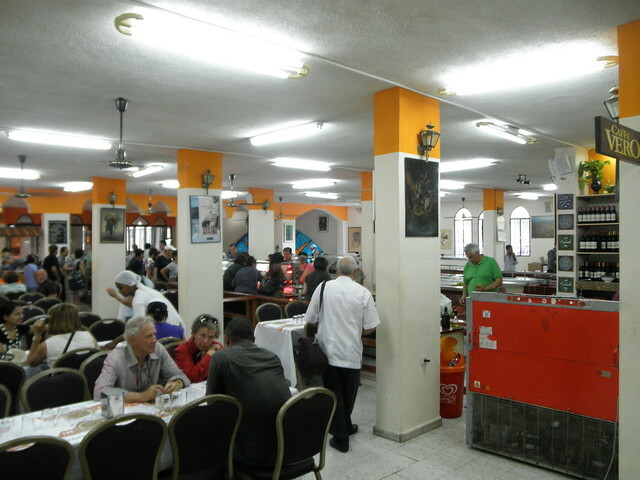 That depressing cafeteria you had to eat at was the last restaurant my tour group ate at in our Israel trip. Temptation Restaurant was it? Yeah, the food was horrible. Even I would’ve eaten at a different restaurant. 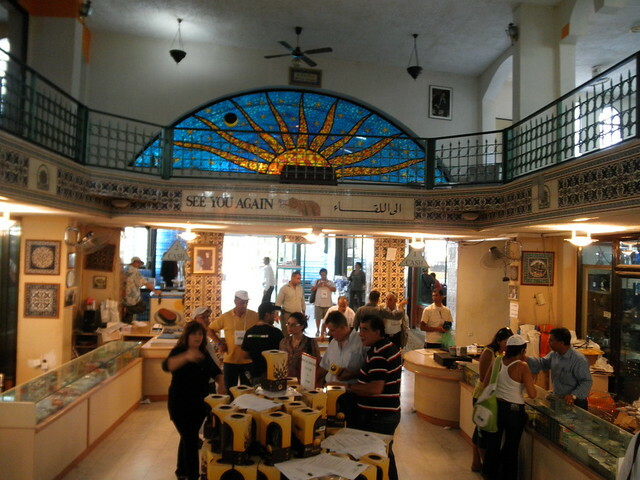 But I liked that tourist center despite the nasty food in THAT particular restaurant. Had beautiful shops that sold the best skin products and I like the Elisha’s Fountain. We are heading to Israel in two weeks, and planned to do a “best of the west bank” tour for one day. Could you tell me who your company was? Do you think it is even worth it to go to Jericho? Thanks! I’d check out Viator.com, I use them all the time. And while Jericho isn’t necessarily worth it on its own, it’s usually include in most day trips. I had a different experience traveling to Jericho. 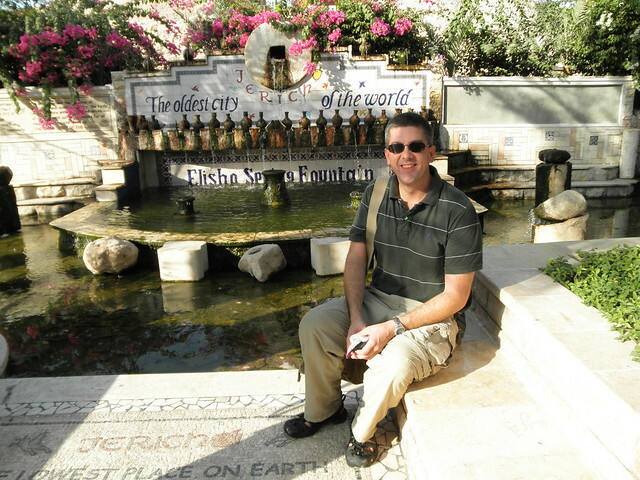 I also went to the so called tourist trap but i had wet shoes from going to the Jordan river when I got there. They were very helpful and sold me a pair of sandals for only $20.00 that I wear often and they are super cute and comfy. Plus they have a camel on them and I rode a camel earlier that day, so I liked them. The downstairs resteraunt that he did not have reservations for was an interesting twist for me. they were taking pictures of me there and telling me biblical stories as well. I was fed free desserts and coffee. They kept giving me flowers as well. The town is the oldest town so I can see how it would be in the state it was in and neglected for sure. I met a minister that said he stayed there with a group for weeks and they loved it there. I think the reason I loved it so much was because I was treated so well there and because of the history of Joshua and Rahab. I felt a connection in that place to the bible. Although, I do understand the bad review if one was not looking at it from a different perspective. I, too, had a different experience, and it was very positive. We had a guide who explained details of the excavations (not gravel piles as mentioned above, and from the photo angle attached). For example, we heard, and saw, that ancient walls were build of alternating rocks and sand, with early civilization inhabitants not having developed the ‘art’ of wall-building. Only 3% of old Jericho is uncovered since the walls are so fragile. It also explains how the ‘walls came tumbling down’, as described in the Bible. All of this was fascinating. The key is having a good guide, or doing some research prior to the visit. The Palestinian Authority does not do a good job of describing this. But when I travel, I try to be better prepared. No it really is as bad as you described. I was there today and dined at the ironically named “Temptation” “all you can eat” restaurant. The food was so bad, I would have had to have spent 40 days and nights for it to be palatable. There is so much potential here because, let’s be frank, tourists want a good story but the sheer desperate need for tourist income is getting in the way. Someone needs to pay for some visualizations – artists impressions – anything to give the impression that you are standing at the seat of civilization. On the other hand, maybe we should consign history to reality rather than the fiction. I was there in November and thought it was a dump. The so-called ruins of the battle of Jericho were nothing to look at. Good thing we didn’t eat there because the food in Israel is usually wonderful.